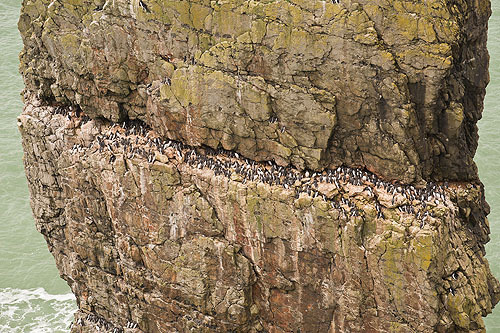 The Eastern stack of the Stack Rocks, with Guillemots crowded together on a ledge . The ledge is a' Palaeokast' Surface . 'Palaeokarst' is a term for a rock or area that has undergone the Karst process ( the disolution of soluble rocks ) and subsequently been buried under sediments.